One of our Community Gardeners was recently in France and wanted to share some of the beautiful scenery! 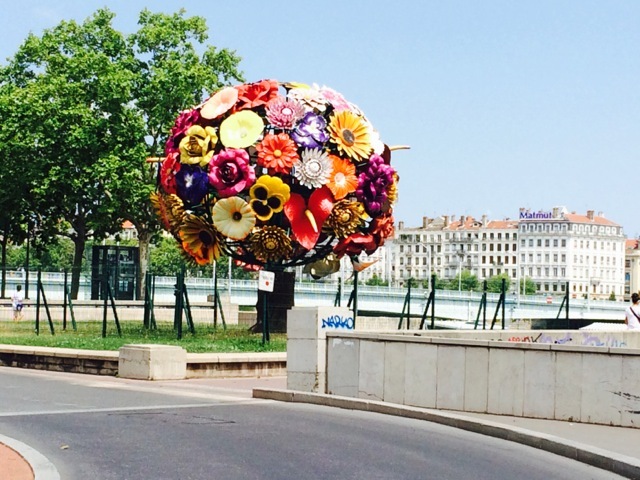 Here’s Paula’s snapshot of a permanent bouquet along the River Rhone in Lyon, France. Enjoy! After our workday was rained out on the second Saturday of June, our July workday turned out very hot with no breeze. George, David and Nathan showed up for our workday. George and Nathan pruned dead wood off the dewberry bushes. George used a string trimmer to clear the grass from around the bushes and Nathan spread wood-chip mulch around the plants. David and Nathan worked on two yard-long bean tents, which David planted in May and Nathan was able to find plants to complete the planting at the Pct. 2 Master Gardeners’ open garden day. David watered several beds and Nathan spread wood-chip mulch on the beans. The lower beds have had a forest of very nice sunflowers. Thanks to Ellie, some of them were used in the sanctuary and many seed heads have been left at bird feeders. Thanks, George, for mowing around the garden and hauling the equipment on the tractor and trailer. George has really made a difference this year with all his work on the Donation Beds. He has produced cucumbers, pumpkins, gourds and a nice crop of watermelons are coming in now. Note: July 16 is the Master Gardeners Lecture at Freeman Library on Fall Gardening from 6:30 – 8:30. Here’s some photo’s from our workday. The first photo is David, George & Nathan in a garden selfie. Note the yard-long beans on the tent over their head’s. George is munching on one.